Agile methodologies flourish when scrum team members, who are central to the success of the agile project, work closely together in an environment that supports the process. Creating the right environment for the scrum team to operate in goes a long way toward supporting the project’s success. You can even hire people who specialize in designing optimal work environments for agile. All these practices uphold agile processes. When everyone works in the same area, it’s much easier for one person to lean over, ask a question, and get an immediate answer. If the question is complex, a face-to-face conversation, with all the synergy it creates, is much more productive than an e-mail exchange. 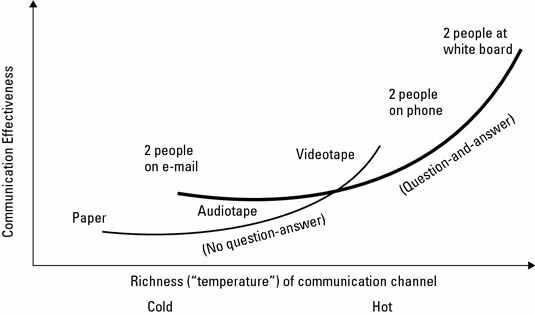 The graph created by Alistair Cockburn, one of the Agile Manifesto signatories, shows the effectiveness of different forms of communication. Notice the difference in effectiveness between paper communication and two people at a white board — with collocation, you get the benefit of better communication. If the scrum team members are in the same physical place, you can create an ideal working environment. If possible, the scrum team should have its own room, sometimes called a project room or scrum room. The scrum team members create the setup they need in this project room, putting whiteboards and bulletin boards on the walls and moving the furniture. By arranging the space for productivity, it becomes part of how they work. If a separate room isn’t possible, a pod — with workspaces around the edges and a table or collaboration center in the middle — works well. If you’re stuck in cube city and can’t tear down walls, ask for some empty cubes in a group and remove the dividing panels. Create a space that you can treat as your project room. The resources you need in the space will vary from project to project, but at a minimum, they can include white boards, bulletin boards, markers, pushpins, and sticky notes. The agile methodologies are designed to create structure for highly productive work carried out in a specific way. The biggest threat to this productivity is distractions that prevent the team from focusing. The good news is that an agile team has someone dedicated to deflecting or eliminating distractions: the scrum master. Whether you’re going to be taking on a scrum master role or some other role, you need to understand what sorts of distractions can throw the development team off course and how to handle them. operations support, and special duties. tasks creates a huge overhead in lost productivity. sacrificing sprint functionality. Don’t mess with the development team members and their work. Distractions sap the development team’s focus, energy, and performance. The scrum master needs strength and courage to manage and deflect interruptions. Every distraction averted is a step toward success. Use moveable desks and chairs so that people can move about and reconfigure the space. Get wirelessly connected laptops so that scrum team members can pick them up and move them about easily. Have a large mobile white board. With this movable environment, scrum team members can configure and reconfigure their arrangement as needed. Given that scrum team members will be working with different members from day to day, mobility is important. Fixed furniture tends to dictate the communications that take place. Being mobile allows for freer collaboration and more freedom overall.